Welcome to episode 100 of 1% Better. Thank you for checking it out. 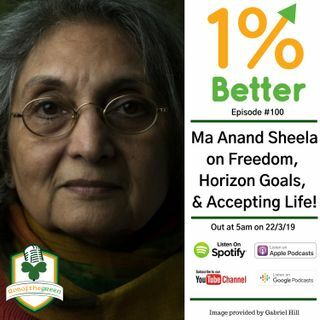 My guest this week is Ma Anand Sheela. Sheela came to prominence recently from the Netflix documentary Wild Wild Country. That's when I learned about her. However many of you listening might have first heard of her back in the early 1980s when she was the secretary of ... Más informaciones Bhagwan Shree Rajneesh, latterly known as Osho. The documentary blew my mind and I was struck by Sheela's personality, devotion for Bhagwan, and then her own seemingly unending quest for power. When I watched the show, I thought how cool it would be to talk with her for the podcast. To learn more about her values, upbringing, what drove her motivations, and of course what life is like for her since the commune broke up and after her time in prison. When I managed to connect with her, tell her about the podcast, and invite her to be a guest, I was delighted when she agreed. •Having a clear sense of who she was always! •Becoming the Secretary – Was this a Business? •Starting to function as a bank! •Tools to keep emotions in check – How did Sheela keep these in check! •Guided Through Bhagwan – he would ensure she was able to say and do what she had to do! •Never feeling fearful so never having to deal with this – her parents were never seen in fear! •Was moving from India to the US the right decision? •Every Choice made was the right choice! •Patience & now being the biggest asset of her work! •Better at dealing with Stress! •Be clear in yourself & what you want to do! •Don't be shy of failure! •Accept life for what it is! Don't be burdened by life! •Learn from History not to create or repeat ugly events in life!